One reason people like to tell stories from the Bible and Book of Mormon is that they are filled with exciting people. There are lots of flashy heroes and villains. The bad guys are regularly held up as bad examples and warnings. The heroes get Sunday School lessons written about them and the children sing songs about them. But the scriptures are not just about the stars of the show. Nephi subdues his brothers in the Book of Mormon. When I was in drama classes, everyone tried out for the starring roles. No one wanted to have a small walk on role with no lines to say. However, every writer knows that every character in a story is absolutely important to the story. Writers never put anyone into a story who doesn’t have an important job to do. Leave out the smallest character and the entire book can fall apart. The same is true for the scriptures. The same is true for real life. Let’s look at one Book of Mormon person who had a small part to play in the stories told and see if we can learn some things that will apply to our own lives, especially if we’re the quiet type and not the flashy hero type. The Book of Mormon begins with a teenager named Nephi. Nephi is pretty much your typical hero type of teenager. He’s probably about fourteen when the Book of Mormon story starts and he was the first author. He didn’t write about his life until he was much older, but it’s mostly from his point of view. He was tall for his age, a good hunter, athletic, strong, self-confident…you know the type, right? 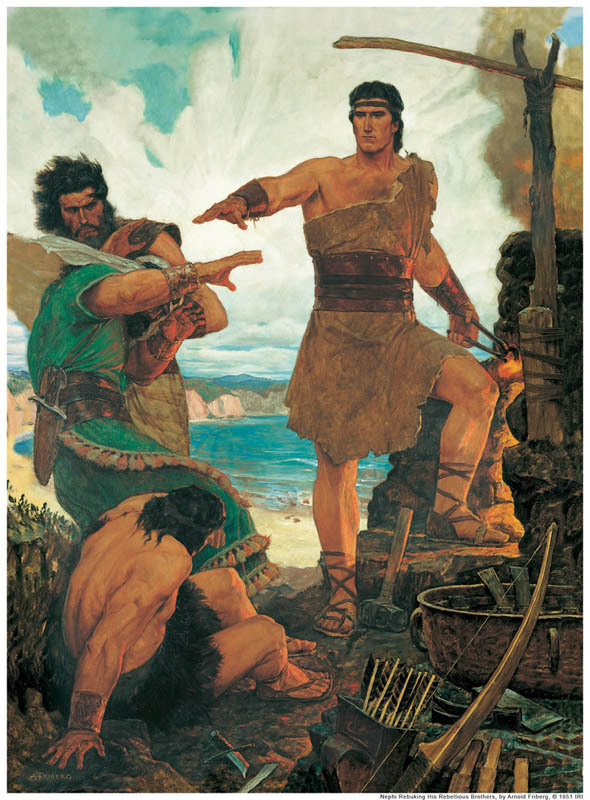 Nephi was the youngest of four brothers. His two oldest brothers were brats. They had a bad habit of beating up Nephi and his next oldest brother Sam. Later, as adults, they’d even try to kill them. But Nephi, sometimes with the help of angels, always wins out over them. But Nephi isn’t the star of this article. In this article we’re dealing with Sam, who is mentioned only a few times in the entire story of Nephi’s life. What do we know about him? He was a middle child—the third of the boys. There were some sisters too, but we think they were already married and living elsewhere by the time the story begins. Like Nephi, he was righteous, which means he tried to do what God wanted him to do. He obeyed his parents, was nice to his younger brother…that’s pretty much all we have in the way of facts. But if we read between the lines, we might see that Sam is a quiet hero. Here’s some background information on the story, in case you haven’t read it. The father of these boys was Lehi and he was pretty rich. The kids had good lives because of that. But then Lehi got called to be a prophet and after that, things got pretty complicated. People got mad at Lehi for telling them to repent and they wanted to kill him. This was in Jerusalem just before it fell. You can read about the fall of Jerusalem in the Bible. Once things got too dangerous, God told Lehi to take his family and only the things they really needed and get out of Jerusalem forever. They weren’t even suppose to take their gold and silver or any fun possessions. Laman and Lemuel, the two bad brothers, were pretty mad at leaving their comfortable life and heading off on a permanent camping trip. Wealthy to homeless—on purpose. Nope, not their style. Nephi and Sam, though, trusted their dad when he said this was what God wanted, and they went without complaint. That’s the first sign of a hero—doing the hard stuff without whining, and in the scriptures (and in modern life), a sign of a hero is doing what God wants you to do without whining. So far, Sam qualifies. After they’d been traveling for a while, God told Lehi to send the boys back to Jerusalem alone. In those days only a few people had copies of the parts of the Bible that had been written so far. Lehi didn’t have one, but his wicked relative Laban did. The boys were to convince Laban to give them his copy, which also included their family history. How did each boy react to being sent on this long trip for a book? Laman and Lemuel whined. It was too far, too hard, too scary. (Laban was really wicked.) No heroes here. Nephi gave a rousing speech to his father, in which he said he’d go because he knew God would never give them a commandment unless He prepared a way for them to keep it. It’s a great, hero-worthy speech and there have been songs written about it. Sam…just went. That’s all. He didn’t whine and he didn’t give a speech. He just packed his bags and headed off. Okay, that doesn’t sound too exciting and no one has ever written a song about Sam doing that. But here’s what I think—and this is my own interpretation of it. I think Sam was a teenager who was used to doing the right thing all the time, or at least most of the time. I think he’d worked hard to become obedient and now he didn’t need to think about it or give speeches about it. He was a little older than Nephi so he’d had more practice doing hard things quietly, whereas Nephi, being younger, was still pretty excited to realize he liked obeying God and his parents. Nephi was learning the kind of person he was and so he needed to talk about it. Sam already knew. He didn’t need to announce it to anyone. That’s the first thing that tells me Sam is a quiet hero. As you can imagine, this trip doesn’t go too well. The brothers politely ask Laban for the records and he threatens to kill them. They even offer to buy them—all that gold and silver they abandoned is still hanging around. Laban takes the money and tries to have them killed without giving them the records. The two older brothers get mad and decide to take it out on Nephi and Sam, seeing as how they were younger and obedient. The beating gets so bad an angel has to show up to rescue them. The angel tells the older brothers to behave and warns them that someday, Nephi is going to be the head of the family, lead the church and rule over them. I’m sure you can understand why God was going to skip over Laman and Lemuel. But he also skipped right over Sam, who was every bit as righteous as Nephi. Why did He do that? We don’t know and chances are, Sam didn’t know either. It would have been pretty understandable if he’d gotten as upset as his older brothers. In fact, he had more right to get upset, since he was worthy of the job. But you know what? He didn’t. Nephi wrote about the reactions Laman and Lemuel had to this, but he doesn’t say one word about Sam’s reaction, which means it was so quiet Nephi didn’t give it much thought. Later, when Nephi is the leader, he has to take his followers to live somewhere else because Laman and Lemuel want to kill him. Sam goes with Nephi. Throughout the rest of the story, the few times Sam is mentioned he is always following the leader, either his father or Nephi. We don’t know if he went home and prayed to know why he wasn’t chosen. All we know is that however he might have felt inside at first—and it would be natural to be a little sad over it—he didn’t use it as an excuse to rebel. He just went about his life doing the right thing, just as he always had. Sam was a quiet hero. Maybe you are too. Maybe no one will write books or songs about your life, but that doesn’t mean you don’t matter. Sam is in the story for a reason. God wanted him there to remind us that you don’t have to be the leader or the star to make a difference in the world. Nephi depended on Sam’s loving loyalty during the hard years ahead. God depended on it, too. And God is depending on you too. Quiet heroes are as important as the stars of the show. Read about Sam and his family in the Book of Mormon. The story of Sam, to be read between the lines.